I have been thinking a little bit about sustainable income. The idea that Faction War should provide a sustainable income to pvpers (via pvping) has been tossed about quite a bit lately. But mechanics don't make me undock. Mechanics don't force me to kill Charlie vs Henry. They don't make me fly in places where PVP could more easily happen. They don't force me to fit my ship. Hell, they don't even make me log on for that matter. Then, there's all the meta-game aspects of EVE where PVP interactions can possibly take place outside the actual game mechanics altogether. So, when we ask (or demand) CCP to provide sustainable income for PVP, we are essentially asking them to provide something they have no control over. And since they don't have that much control over whether or not you log on to PVP, or become any good at it or not, they can never really make it sustainable for you, can they now. Unless, of course, you think you should be paid for dying. Secondly, what is and isn't sustainable is relative. Someone who only flies tech 1 fit thrashers will need much less to be 'sustained' then someone who continuously romps around in faction fit macherials. So at what level are we sustained 'enough'? When you can make 50 million an hour? Or 500? If I took a poll today of 100 people, I would get a 100 different answers. I sympathize with the desire to make more ISK. And, I wouldn't turn down any more that CCP might want to throw my way. However, I consider my friends' story. And, I look at the rather sizable loot hoard I've accumulated as the result of my mediocre pvp skills. And I can't help but thinking that the biggest problem for these people --the people who ardently claim that PVP is not nearly sustainable enough for them --exists somewhere between their keyboard and their chair. You fail to account for the key factor. How much you need to pvp depends on how much your opponent has. If your opponent can always out number you and fly faction and t2 cruisers then being able to fit up t1 cruisers and afs won't really cut it. Even if you can fly battleships you won't do well if your opponent can outman you and fly battleships with capital support. LOL - you just plain fail. Having a fat wallet doesn't make anyone a better player - most of the time, it just makes them stupid. My mates and I, as well as many other competent PVPers, routinely pop opponents, who outnumber us, and are flying more expensive ships. Nothing beats flying around in T1 frigs and cruisers, getting jumped by bunches of idiots in T2/faction ships looking for the easy kill, and sending them home in pods, crying in local. Skill and practice trumps ISK and stupidity, every single time. LOL anonymous who claims he is so pro, but who hasn't played eve enough to realize that when you are fighting a war there are times you can not match the firepower and numbers the enemy brings. Having more isk means you can go ahead and ship up to meet them. You don't care if you lose so much. But when everyone has half the isk of the enemy there is no fight. People just don't have enough enough powerful ships. there are many ways to make isk. take care of yourself. its not up to ccp to pay you more to do whatever it is you do. I've not heard people complain that they aren't making enough money, but then again everyone in agony is self sustainable beyond FW. Which coming from NPC nullsec where you don't get anything but loot from kills is understandable. I have however made the sad realization that FW has made me poorer; At least in liquid isk. I can have shiny ships and I can sell those ships to get ISK. But unfortunately I can't keep those ships and get ISK as well. :) Let alone buying the modules to then fit those ships. No money worries, just a small hole where money used to be, now replaced by some fitted ships in my hanger. Luckily there is still JeveAssets to inform me that I indeed made some money from all this faction warring. However I do think the current way LP is handled is probably going to turn out wrong. I think that because of the tier system impacting LP gain there is a too strong incentive for people to join the winning side, which creates an imbalance in power, which creates a mismatch in fleet sizes, which in turn can ruin pvp opportunities. It's obviously not that black and white or even that simple. Time will tell I guess, but I think the current system will still turn out bad. Having said that, both on the forums as well as in his visit on FWeddit comms Hans pretty much agrees with the sentiment in terms of PvP LP, and it's just CCP that needs convincing. It is however always a strange sensation when especially on the forums people sometimes talk about LP as if it's the most normal thing in the world that you should be paid for PvP. I may have my moments of weakness when I just want to kick them all to the middle of Syndicate and let them live there for a few months. So that when they get back they will have the same level of novel appreciation for LP as I have; A nice bonus, but I need no incentive to pew beyond the pew itself. Of course I then remember myself that FW is CCP's way of constructing a place for people to PvP without having to have alts to make money on the side or run missions or whatever most of us do to keep in ships. So in the end I can't really blame people for being obsessed with what might be their sole source of income. damn straight! since when did you have to make more isk than you lose to pvp? That's weird. I'd like to say that i don't think the people that join FW for the lp isk gain impact the pvp all that much. they mostly dont fly pvp ships and join gangs etc. lP/isk whores are running their plexes and making money, not pvping. I certainly didn't see an influx of pvp pilots into the minmatar militia at inferno. a few. but mostly our numbers balooned with plexing alts who don't fight at all. they dont even fit guns! so if the new system still encourages isk making whore alts to join winning sides, it wont affect pvp much. it does have a large impact on the ability of the smaller side to take systems, however. The LP payouts currently aren't that bad. Most people simply don't notice it because they are always in fleets where the LP payouts are split between all pilots on the kill. So, how do you make LP when it gets split like that? You simply lower the amount of people on the kill. It's an incentive to fly in smaller gangs. If the opposition has more out, then you find ways to divide and conquer. "It's obviously not that black and white or even that simple. Time will tell I guess, but I think the current system will still turn out bad. Having said that, both on the forums as well as in his visit on FWeddit comms Hans pretty much agrees with the sentiment in terms of PvP LP, and it's just CCP that needs convincing." I don't know what he said to fweddit but he has been very much in favor of this new unbalanced system on the forums. Can you point me to a place where he has been critical of it? "It is however always a strange sensation when especially on the forums people sometimes talk about LP as if it's the most normal thing in the world that you should be paid for PvP. I may have my moments of weakness when I just want to kick them all to the middle of Syndicate and let them live there for a few months. So that when they get back they will have the same level of novel appreciation for LP as I have; A nice bonus, but I need no incentive to pew beyond the pew itself." Id rather they did away with the lp altogether(like pre inferno) instead of giving one side 2 to 3xs as much of it. Thanks for the link. But of course pvp in itself doesn't really effect occupancy. He has done nothing but support the occupancy mechanic even though he knows it has no economic balance. Well hans Amarr has been at an economic disadvantage since inferno came out. Yet Amarr has lost major corps in the meantime how many has minmatar lost? The number I see online show minmatar have a larger numbers advantage than ever before. How can you look at all these numbers and say the alleged pvp incentives are outweighing the economic incentives? Well, I didn't claim he was or wasn't for full equality in LP gain. Just the LP for pvp. Which I think is reflected in those links as being his standpoint. than ignore the lp, cearain! it dosent affect your ability to fight! fight for fighting sake. to act like you have to make isk out of it or you wont do it is your problem. If you don't care about how much lp you get, this system is even more fun than the old system! plenty of us do just this. You apparently run plexes to make isk and whine that someone else is making more isk than you at it. Hans told Fweddit that he completely agreed with them on this subject. The again Hans is a politician, his job is to tell people what they want to hear. Susan Jagerblitzin made it clear that under the current system (which he/she pushed through) its unqualified economic foolishness to fight for the losing side. There is a fundamental problem with "sustainable PvP", even if the amount of money and the type of ships would be equal: it's sustainable only to the one who kills, and never to the one who dies. The dead guy will not be able to sustain himself via PvP so he will leave the PvP zone. Who will you kill after that? The ONLY way is that the dead guy sustains himself via PvE and doing PvE forces him to go to the zone where you can shoot him. The PvE is essentially risk free at the moment, and even after the winter patch that won't change much when the "button" (the thing you orbit in a plex) gets moved closer to the warp-in (the place you land after activating the acceleration gate). All normal plexes have acceleration gates similar to many missions. Combined with warp mechanics this means you have at a minimum 20 seconds to get away at the first sign of trouble. As such, any ship that aligns faster then 20 seconds can avoid pvp in plexes if he doesn't favor his odds. Then there is travel to actually get to plexes. You might sometimes get caught on gates but unless it's a gate camp specifically set-up to catch frigates it's pretty much a none issue. So even if you are a 5 day old character in a t1 fit frig you can still sustain yourself in FW even though the chance of winning any kind of fight is unlikely. And truly, that is the only kind of person who would not be able to win any fights at all in FW. Even very low SP/new players are welcomed with open arms in corporations like fweddit who to my knowledge take a lot of care for their new members who might be low SP and new to the game. Fweddit has proven that even while flying t1 fit thrashers they can get kills. Sure it takes many numbers and that reduces the LP you get, but a small group of say SFI's can get very cocky about what they can and cannot take on. It's an interesting question. As far as I see it any income source can be sustainable, providing you manage your costs. For example it's currently possible to maintain a sustainable income from piracy (that is, ransoming and looting for profit). Compared to the income you can make in FW (even after the nerf) it's nothing, but it's enough to keep you in ships and modules providing you fly sensibly and pick the ships that you fly based on your budget. FW PVP makes more money that piracy by a huge margin (especially since there's nothing stopping you from combining the two - you get the loot from your kills already). Providing you're not terrible at PVP and you fly fairly cheap, you can already make it sustainable. Of course it's not sustainable if you fly expensive and/or die a lot, so when people ask for a sustainable income source what they're often really asking for is a *better* income than the one they currently have, so they can afford to lose more. The less skilled players or players unsatisfied with the income their preferred style of play makes. Only "the best" in profession can make a luxurious income for that profession @ w.e. it happens to be. Those who are not "the best" maybe just average not necessarily bad are simply not good enough to make their preferred income match their preferred style of play. the must go other - less preferred - styles of play in order to get closer to their preferred income which ultimately leads them to claim imbalance. As always seems to be the case the case in EVE: the divide in player skill directly correlates to player success versus players as it applies to the same skill in question. Susan, what you are forgetting is that eve is a game. CCP can make as many "Eve is real" commercials as they want but it does not make it real. Since we have now established you are wrong about the "mechanics" argument lets move on to the "sustainable" part. Since we play a game that is very unforgiving(lose ships every time you die) there has to be a way to replace those ships. If you live in null sec your alliance could replace them for you could rat or run sites. If you live in high sec you have missions and industry. If you live in low sec you have........nothing. The LP and items FW players can get and sell allows them to play the game Susan. If you have a single account and a job you kind of need the LP to even afford thrashers and ruppies. It seems to me you are against anything that does not directly benefit you. Let the Amarr have a little isk Susan it will keep things interesting. Given that Minmatar have about 2xs as many pilots as amarr. And given that they will make 2xs as much isk from every occupancy related activity as amarr. Amarr's best strategy is to just let minmatar take over all the systems and be done contesting systems. Continuing to give minmatar 2 isk for every isk we make is just stupid. cearain is dumb! fly if you want. shoot if you want. to act like how much isk you make at pvp or how much isk someone else makes at pvp is the only factor in determining what you do in eve is really stupid. minmatar have a bunch of plexers bloating the numbers whoring isk. so? that has no bearing on the pvp environment. or at least, very little. undock your ships and fight! we all did this pvp thing before LP rewards, you know! i feel that pvp is meant to be an isk sink; it wouldnt -really- function as a sink if sustainable pvp was implemented. 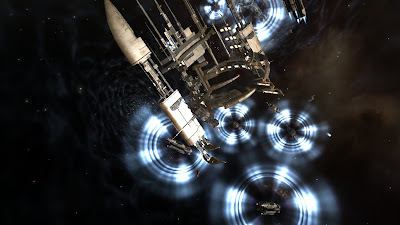 that being said, it would be a massive concept change for CCP for a feature which wouldnt really do anything good to FW -and- eve, especially its economy. CCP themselves said that they would like fw to essentially be a larger, RP version of rvb, with some isk potential. ppl join rvb to learn pvp and have fun; it also does the game good by acting as a sink. with sustainable isk as an incentive, it wouldnt be about fun, it would be all about isk gained. not only that, but again, its just be another obstacle in the economy. exactly! right on! pvp has to be an isk sink!